FULTON – Fulton City School District elementary school students were recently treated to humor and history during a visit from bestselling graphic novelist Nathan Hale. 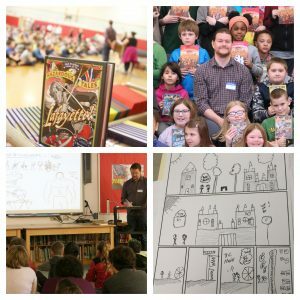 Author and illustrator Nathan Hale recently visited Fulton City School District elementary schools where he reviewed graphic novel-inspired art projects, autographed books and shared historical highlights as he created new stories. Hale, an author and illustrator, brought his passion to Lanigan, Granby, Volney and Fairgrieve schools as he shared of-the-moment illustrations and stories about American history. Students of various grade levels experienced Hale’s excitement of storytelling as their interest in literacy peaked during his visits. At Fairgrieve Elementary, the entire student body greeted Hale with welcoming signs and illustrations as library media specialist Barb Senecal introduced him during one of the school’s recent Morning Express program. Thanks to donations from the Fairgrieve parent-teacher organization, Senecal’s Donor’s Choose project and other funds from staff members, 90 brand new Hale-authored and -autographed books were purchased for students in grades three through six. Ahead of his visit to the school, art teacher Kimberly Kittleson required students in grades three to six to create their own graphic novel pages, based on grade level-appropriate lessons, such as Vikings, Medieval Times, the Renaissance and Titanic. Several participants were selected to spend their lunch time in the art room with Hale for a special workshop. The real highlight for students at all elementary schools was when Hale spent time with small groups while he offered factually-based stories and in-the-moment illustrations of key American history moments. He detailed when President Thomas Jefferson doubled the size of the U.S. with the Louisiana Purchase, the Lewis and Clark Expedition, who York was and his important role, the Corps of Discovery, contributions of Benjamin Rush and the role of Sacagawea, among other highlights.